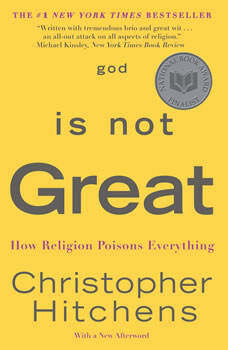 Whether you're a lifelong believer, a devout atheist, or someone who remains uncertain about the role of religion in our lives, this insightful manifesto will engage you with its provocative ideas.With a close and studied reading of the major religious texts, Christopher Hitchens documents the ways in which religion is a man-made wish, a cause of dangerous sexual repression, and a distortion of our origins in the cosmos. With eloquent clarity, Hitchens frames the argument for a more secular life based on science and reason, in which hell is replaced by the Hubble Telescope's awesome view of the universe, and Moses and the burning bush give way to the beauty and symmetry of the double helix.In the tradition of Bertrand Russell's Why I Am Not a Christian and Sam Harris's The End of Faith, Christopher Hitchens makes the ultimate case against religion. Worry. Confusion. Anger. Depression. If any of these are a constant companion in your life, there’s a battle going on in your mind. You’re not alone, though, and the war isn’t lost! God wants to fight this for you. It seems to me that the author actually directed this book toward the religious in hopes that they might take from it a realization that their path in life is a farce. Quite sure from past experience that this is not going to be the case, it is quite likely a book that will be far more of interest to the argumentative atheist which I am. Covering a broad spectrum of religions, belief structures, origins, similarities, and contradictions, the author did a excellent job of showing the ridiculous tendencies of various religions. Focus is primarily on various sects of Christianity and Islam but there are numerous mentions of some of the other prominent players in the game such as Mormons, Jews, Hindus, etc. I cannot contemplate any way a reasonable person could argue with most of the points made in the book. The writer is knowledgeable, clear, and concise, getting to the point and explaining it clearly. If you have any interest in the constant debate over the usefulness of religion or have questions about your belief, I highly recommend this book. Much of this book seemed like it was much older than it really was. As an agnostic he just comes off as a party pooper since much of life is just a pleasant fiction to avoid our own thoughts of mortality. I dont normally write reviews. I was motivated because he said very clearly in the book that John Adams was a slave owner and that upset me because most of our founding fathers were not Christians so he makes the link to Adams' Christianity as being duplicitous of course since he was a slave owner. Convienant for the author but completly wrong in its ***eration. It made me mad because its so easy to say relegion ***** you don't have to fudge the facts to do it. So it kinda made me feel like he was over zealous to the point of relegiousness in his atheism.